Q: My daughter has fallen in love with one of the horses at her lesson barn. She does wonderful with him and he is great with her. We are thinking about leasing him with the option to purchase him at the end of one year. He’s been successful on the hunter/jumper circuit, which is what my daughter is working towards. However, we’re concerned about his age. Initially, the trainer had told us he was 15, but when he was vet checked, the vet looked at his lip tattoo and said he is 20. He’s still strong and healthy, but he does get Bute for occasional joint pain. Is it okay to continue jumping a 20-year-old horse? We don’t want to cause him to go lame, and if need be we would just trail ride and enter him in flat classes. A: It is absolutely fine to jump a 20-year-old horse as long as he remains a sound and willing mount. 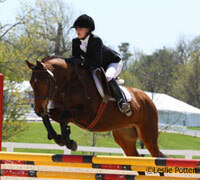 Older horses are perfect mounts for budding riders and shouldn’t be shunned because of age. The most obvious aspect to consider when dealing with older yet still active horses is degenerative joint disease. Realizing that osteoarthritis is present in all older horses and will worsen with time will help keep you realistic about future goals with this mount but maintaining your horse’s active lifestyle can aid in keeping those joints supple. 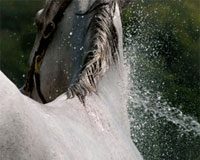 Consider adding a glucosamine/chondroitin joint supplement to help keep your horse’s joints as lubricated as possible. There is a plethora of choices out there when it comes to choosing joint supplements, as they range from oral additives to injections. Consult your vet on what’s best for your situation. An occasional nonsteroidal anti-inflammatory drug (NSAID) such as phenlybutazone (bute) or Equioxx (firocoxib) for a challenging workout is ok but when your mount starts requiring more days with NSAIDs than without, it’s time to start decreasing his workload. Another health aspect to keep in mind is your horse’s weight. Annual dental check-ups to file any sharp points or uneven wear will help ensure your horse’s teeth are in the best shape they can be and annual vet visits will allow your vet to assess musculoskeletal conditioning, aches and pains, and overall general health. Most of all, listen to your horse. His attitude will tell you lots of things. If you notice subtle changes in his behavior during a workout or he becomes sour, he’s telling you things hurt. Keep cognizant of his age and do plenty of warm up exercises to limber him up before asking him to perform at a higher level. With proper care and nutrition, this mount may give many more years of reliable riding for your daughter. I 100% agree with this! But don’t use too much bute. This article was interesting & informative! I agree with the article. The only thing I would say is A) Most certainly a joint supplement and B) Bute only if and when needed. I’ve a 19 year old QH that sill jumps and is on joint supplements, he barely rarely needs Bute. Most horses will let you know if they are still willing. This article makes me feel a ton better. My 15 year old gelding and I compete in big eq (3’6″) and I initially had a concern for his health. If jumping a 20 year old horse is fine, then I’m sure my horse is in the prime of his life. Thanks! Good article. I best liked the last paragraph. Your horse knows better than you do what he can and can’t do. This is so true. Both me and my barn buddy’s favorite horses to ride at the barn are 30+ year old geldings. They are both still pain free, healthy, and love to act like they are 2! We still jump on them and to be honest I think they love still being treated like all the rest of the horse, not the old guys that are there just to be looked at and petted. This is so true. Each horse is different and sometimes the age at which he started jumping, especially hard training may be a factor. We have 31, 33, and 20 year old horses and have found that B-L Pellets seem to help with their joints. Also I spoke with a woman who had an Arabian who competed in 3 day eventing until she was 28, then lived to be 40. Amazing!